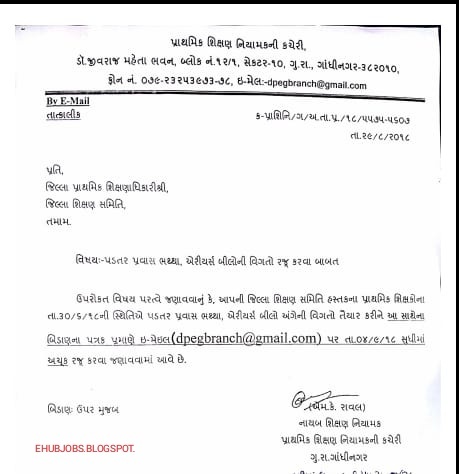 Padtar Pravas Bhaththa, Ariusys Bilo Babat Niyamak Shree Circular. Padtar Pravas Bhaththa, Ariusys Bilo Babat Niyamak Shree Circular.Friends ,our website is very popular educational website in Gujarat. We Published daily educational news, New jobs, CCC, Results, Call Letters, Jobs in Gujarat, Bank jobs in Gujarat,Bank Jobs in India, GK ,GK Gujarat, Current Affairs, Dailya Current Affairs,technology news,cricket news in Our website. we are also updates latest Gujarat all competitive study materials,PSI /ASI Bharti Study Materials, TET TAT HTAT Study Materials ,GPSC Study Materials, CCC Exam Study Materials, GPSC Class 1-2 Exam Latest Study Materials , GSRTC Conductor Exam Study Materials in our site We are Also Published Upcoming GSEB TET Exam 2018 ,GSEB TAT Exam 2018, GPSC Various Exam 2018, GSSSB Exam 2018,Talati Bharti 2018, Junior Clerk Bharti 2018, Vidyasahayak Bharti 2018,HTAT Bharti 2018, TAT Bharti 2018, GSERB Shikshan Sahayak Bharti 2018.